Emotional intelligence has gained increasing prominence in the literature on leadership, suggesting that leaders must be attuned to others and their needs, as well as to their own needs. It’s a powerful notion and serves as a useful counterpoint to lauding business nous and being simply a savvy manager. But for me, EQ doesn’t quite cut it either. I’m drawn more to the concept of emotional integrity (Robert Solomon). Let me explore why. I have no argument that bringing EQ into the leadership equation has been a major and necessary development. The likes of Goleman or Mayer may help legitimise a more rounded view of the leader’s skill-set. Not that we can claim contemporary ownership of the idea of the intelligent management of emotions: Plato in ancient western and Confucius in ancient eastern civilisation are just two examples of philosophers ahead of that game. 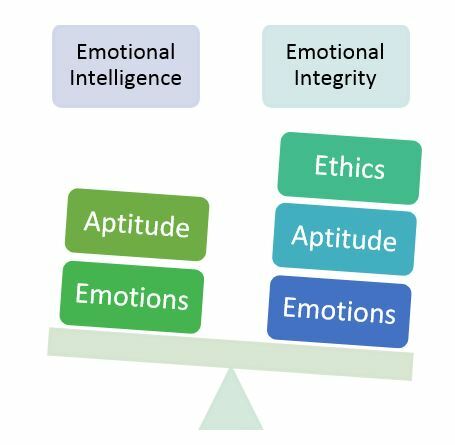 In the modern-day, the interpretation that seems implied in the term “emotional intelligence”, however, is sometimes of a more studied, self-conscious approach. Would-be leaders are encouraged to become adept inter-personally and to hone their people skills. That they need strong interpersonal skills is not at issue, but rather whether intelligence or aptitude in this regard is sufficient? Expressing your own and encouraging others to express feelings and emotions (emotional) – tick; having an aptitude that helps you understand emotional context and nuance and be able to manage that (intelligence) – tick; but something is missing. The critical third factor is that such intelligence is used wisely and ethically (integrity) – double tick. It isn’t simply a matter of connecting or being charismatic; of being a good “people-person” – that could be manipulative. The question is one of how you act; the quality of your actions and the end to which you use your ability. All in all, emotional integrity seems a more accurate representation of the requisite leadership capability.